BTC - Lot's of emphasis on free speech and political opinion, analysis and essentially taking a stand on the irritable climate for digital privacy. Washington Times "Big Brother continues his intrusion..."
"It is now technologically possible to track everyone all the time, essentially," Mr. Calabrese said. "Congress needs to recognize that new reality and treat this information as private." Barksdale, from Google... yeah he did watch some kids. DHS doesn't just make the news, it reports on the reporters! US laws against public surveillance...exist! BTC - With the sheer volume of reporting I read daily about the loss of privacy sandwiched between the private and business sectors, it's beginning to seem more like an invisible electronic cage than a free society. When you fold in governments continuous legal bids for powerful technologies to surveill the public this might amplify your clipped and cagey responses on social media. It happens at every level of public life. Corporate competitors spy on each other. Political opponents spy on each other. Family members spy on each other. Nosey degenerates who are bored spy on each other. Why not? Before I completely lose my mind, I have to be reminded that the only thing standing in the way of chaotic super surveillance societies ...are laws. Privacy and technology laws do exist. How up to date and effective these laws are will be an ongoing matter of "legal upgrades" and interpretation. With so much up in the air I wonder - how any product marketed to the general public to surveill anyone for ~$60.00 can be legal. You can post a digital camera anywhere. If the government is prohibited from watching us, what stops creepy political opponents, frenemies or power trippers from getting a hold of your digital information to try to hurt you and your life? "Remember that 27 year old ex Google engineer, David Barksdale, who's allegedly been hassling minors, not miners, with cyber-stalking and snooping? The great and mighty 'Ogle fired him, but here's exactly how he's in trouble according to federal law in the US." There simply isn't anything in the Constitution that protects someone's perceived right to super surveill another's private actions. However, there are people who have forgotten how to care about things like laws or privacy, like the makers of digital "cookies for cars", BUMP! For the record, the people who invented BUMP! 's ability to text a license plate are probably sponsors of the Darwin Awards. Combining the experience of texting and driving [illegal already in California] is a way to harm yourself. Wait until someone registers you without your knowing, like your insurance agency or that creepy guy from statistics class. See? That's why you need privacy laws. 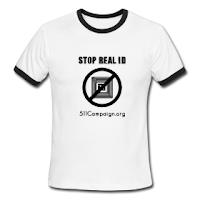 BTC - Pennsylvania state activist Aaron Bollenger reports that an amended version of an anti-Real ID bill cleared committee and is moving toward the House. While this is good news for privacy and identity advocates, those most concerned cannot sigh relief for such a long way to go. "Session is short – make some calls! If you know others in PA, please pass the word and contact me if anyone needs help with telephone speeches to key members," said Bollenger, who is urging those involved in Pennsylvania State government to move this by next week before opportunity is lost. Other concerns lie in wait. According to PA ACLU Legislative Director, Andy Hoover, the bill may face a veto if it reaches his desk. If so, activists like Jim Compton won't be giving up the search for the 2/3rd's vote necessary to override the bill. "Legislative support of Real ID comes from representatives of both political parties currently holding office at our state capitol. The party in power in Springfield will do anything to please the establishment in D.C., and the minority party is torn on the issue, as it was the Republicans in D.C. who originally passed the bill to begin with. As is the norm in Illinois, we cannot take for granted that either party will stand up for our rights! This battle can be won - but only if citizens all over the state actively participate." "And so ID cards finish their passage in the Commons. 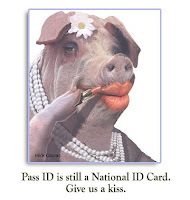 It was an historic day – and full credit to Liberty and the NO2ID card campaigns who along with Liberal Democrats and Conservatives stood up for civil liberty and freedom." Related News: NO2ID "ID cards may be gone – but ‘ID checks’ are out of control"
First up... Craigslist, Craigslist, Craigslist... what is happening to Craigslist? By now everyone, should have heard about the use of RFID in school clothing. It looks as if building ducts could be adding to the lists of unintended consequences towards surveillance advantage. I was in utter shock I finally at my wits end on how difficult it was to just renew my drivers license! So I said; “I can’t believe this, Here I have all kinds of proof of who I am and I can’t get my license renewed!” I did not shout this, but my voice was raised a bit in utter shock over this whole insane situation! Then what topped it off is the other woman working next to her asked; “Do you NEED ASSISTANCE over there?” It was said as a threat to me!!!!! That did it, I said; “Just Screw Driving, I have had it!” She kept typing at the computer. I then reigned in my emotions and tightly said: “May I have all my documents please.” She didn’t say anything so again I said “May I have all my documents, Please.” She then told me she was inputting them into the computer so it is there if I come back. She then printed off a sheet and handed me everything and I left. I was so upset and in total disbelief on how hard it was to get a stupid license renewed when if I did not have the CDL on there to begin with I could have renewed ONLINE without a shred of evidence of who I was!!!!!!!!!!!!!! The letter below has been sent to ALL Florida Representatives and Senators! When will you say enough is enough? I have and will no longer play the political 2 party game! I’m Done With IT! The email addresses to all Florida Legislators are posted below the letter. A link to the Florida Against the Real ID Act site is at the very bottom. It is important to note whenever Floridians get up the gall to reverse the tides concerning liberty. WORTH THE FIGHT: The FTC is looking into a law to prohibit online tracking. EPIC's is also doing more to root out the truth on what's going on with that Google/NSA partnership. That part about Google makes me feel unlucky today. Don't you think you'll need it after reading this? BTC - Latley the initial run to chill national identity by privacy and civil liberty advocates isn't enough to stop national identity from moving forward. The bureaucratic process tends to anchor plans within agencies like a parasitic vine growing slowly, choking the host [taxpayer]. The trend towards bureacratic handling is more fortuitous for contracts going forward without the formality of public opinion. The post-op quandry we then face is simply "what's done is done." Whether we want it or not. Why is it like that? To answer simply: well, you paid for it...in taxes. Rather, the feds paid for it or local government paid for it on the bully pulpit that a contractor may find ways to sue or to find plaintiff for NOT complying with federal law. This isn't unique to national identity, of course. It's how the business of surveillance is typically done, because Americans generally do not share the same vision the federal government does on this issue. This tactic becomes defeated if local populaces can consistently document their dissent against the use of their local and federal dollars for these purposes. This tenet can be applied to so many scenarios. The people may so prevail, either by election or by public petition. However - they also have to know what's going on. It is always good when the government invites public input. While it is visible to people with trained eyes - it often isn't visible to the people who care the most. The hard work for advocates is to reach those most concerned in time allotted in order to document their concerns. Programs like NSTIC may be moving at a snail's pace, but they are moving. The matter of a budget is needed to consult makers of desired technologies initiating dances of delicate and non-specific natures. That's the conventional recipe for the incremental adoption of any technology into government. A small thing like regulations may be determined later. Concretes are not distilled in "high concept" dealings, but one thing is clear - the people who understand NSTIC the most have not expressed any intent to continue public input. That would probably interrupt the shopping, the love gifts and the electioneering. Recent history demostrates both the marketplace and public users have well documented views about mandated identity systems over its connection to compromised privacy [Example: World of Warcraft's Real ID system]. Regardless...meetings are being held this week to discuss the future of NSTIC's national online identity "ecosystem". The vision of a perfectly controlled online climate, free of the interference from bonafide public opinion can be maintained as long as you stay out of the way.